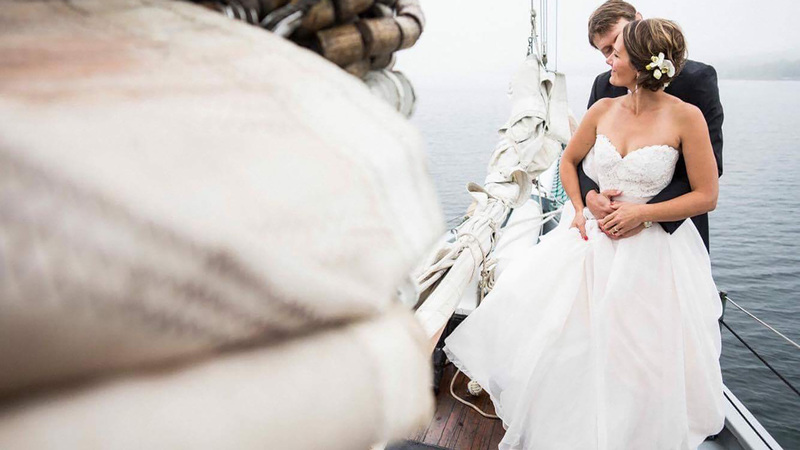 Set sail for the ceremony of a lifetime! The Edith M. Becker is a romantic and nostalgic stage for your special day. This traditionally rigged schooner is the perfect vessel for small wedding parties, accommodating up to 23 guests. Wooden spars and decks and bronze instruments make for spectacular photos on this vintage tall ship. Find tranquility as we set sail and turn off the engine. Our captains are fully ordained and experienced in making your day memorable while underway. Champagne is served and your own special decor can be arranged before departure. A cannon salutes your nuptials as we strike the sails and return to shore. This is the boat of choice for the most romantic and intimate setting you can find for your small wedding ceremony. Our crew will cater your wedding sail to your specifications whether that means narrating the history of Door County and the boat or sitting back and enjoying the silence and romance. Food and drinks can be catered or you may bring your own!